The Remington S1450 Ceramic 215 straightener has Ceramic coated plates delivering sleek and smooth hair with every effortless stroke. And itâ€™s fast-working, reaching a top heat of 215ÂºC in just 30 seconds, helping you to achieve silky, shiny hair without having to wait around. 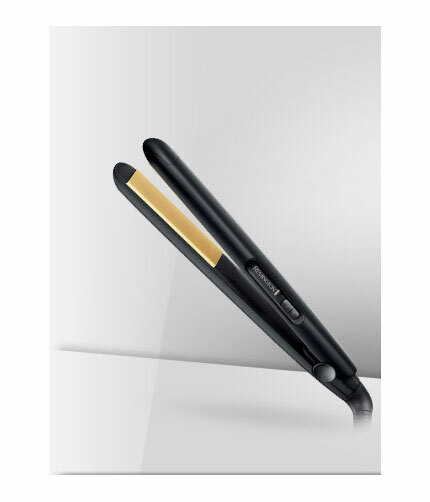 The premium Ceramic coated plates ensure the heat distributes evenly throughout the straightener, keeping it at the temperature selected with no hot spots. It creates an easy and effortless glide during straightening with no snagging, flattening your hair cuticles for silky, smooth and shiny results. And it ensures long-life plate wear, protecting the plates against styling products and scratching. The ergonomic design makes it oh so easy to use. They fit neatly in your hand without feeling uncomfortable and chunky. Whatâ€™s more, the innovative floating plates cushion your hair whilst straightening leaving it perfectly smooth and indent free.